Electric buses were seen as a joke at an industry conference in Belgium seven years ago when Chinese manufacturer BYD Co. showed an early model. Suddenly, buses with battery-powered motors are a serious matter with the potential to revolutionize city transport — and add to the forces reshaping the energy industry. With China leading the way, making the traditional smog-belching diesel behemoth run on electricity is starting to eat away at fossil fuel demand. The numbers are staggering. China had about 99% of the 385,000 electric buses on the roads worldwide in 2017, accounting for 17% of the country’s entire fleet. Every five weeks, Chinese cities add 9,500 of the zero-emissions transporters — the equivalent of London’s entire working fleet, according Bloomberg New Energy Finance. All this is starting to make an observable reduction in fuel demand. And because they consume 30 times more fuel than average-size cars, their impact on energy use so far has become much greater than the than the passenger sedans produced by companies from Tesla Inc. to Toyota Motor Corp.
For every 1,000 battery-powered buses on the road, about 500 barrels a day of diesel fuel will be displaced from the market, according to BNEF calculations. This year, the volume of fuel buses take off the market may rise 37% to 279,000 barrels a day, about as much oil as Greece consumes, according to BNEF. China is ahead on electrifying its fleet because it has the world’s worst pollution problem. With a growing urban population and galloping energy demand, the nation’s legendary smogs were responsible for 1.6 million extra deaths in 2015, according to nonprofit Berkeley Earth. A decade ago, Shenzhen was a typical example of a booming Chinese city that had given little thought to the environment. Its smog became so notorious that the government picked it in 2009 for a pilot program for energy conservation and zero-emissions vehicles. Two years later, the first electric buses rolled off BYD’s production line there. And in December, all of Shenzhen’s 16,359 buses were electric. BYD had 13% of China’s electric bus market in 2016 and put 14,000 of the vehicles on the streets of Shenzhen alone. It has built 35,000 so far and has capacity to build as many as 15,000 a year, Ho said. Other cities are taking notice. Paris, London, Mexico City and Los Angeles are among 13 authorities that have committed to only buying zero-emissions transport by 2025. London is slowly transforming its fleet. Currently, four routes in the city center serviced by single-decker units are being shifted to electricity. There are plans to make significant investments to clean its public transport networks, including retrofitting 5,000 old diesel buses in a program to ensure all buses are emissions-free by 2037. Those goals will have an impact on fuel consumption. London’s network draws about 1.5 million barrels a year of fuel. If the entire fleet goes electric, that may displace 430 barrels a day of diesel for each 1,000 buses going electric, reducing U.K. diesel consumption by about 0.7%, according to BNEF. Across the U.K., there were 344 electric and plug-in hybrid buses in 2017, and BYD hopes to be picked to supply more. 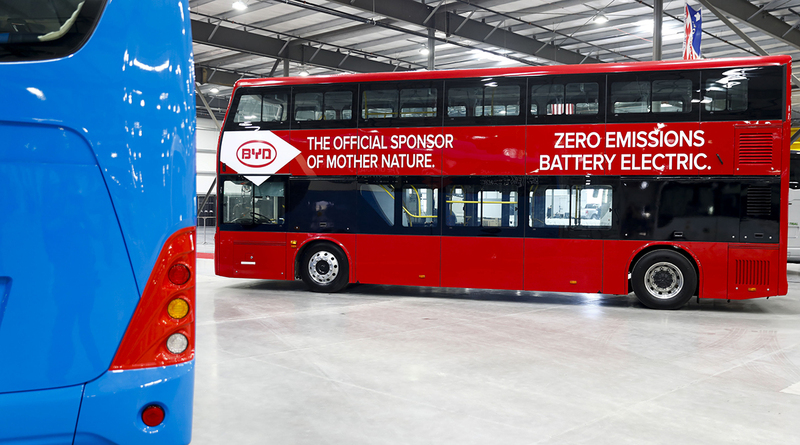 It has partnered with a Scottish bus maker to provide the batteries for 11 new electric buses that hit the city’s roads in March. Falkirk-based manufacturer Alexander Dennis Ltd. began making electric buses in 2016 and quickly has become the European market leader with more than 170 vehicles operating in the United Kingdom alone.